The result of a collaboration among eight women scholars, this collection examines the history of women’s participation in literary, journalistic, educational, and political activity in Latin American history, with special attention to the first half of this century. Emilie Bergmann is a specialist in Spanish Golden Age literature in the Department of Spanish and Portuguese, University of California at Berkeley. Janet Greenberg is an executive associate of the American Council of Learned Societies in New York. Gwen Kirkpatrick teaches Latin American literature in the Department of Spanish and Portuguese at the University of California at Berkeley. Francine Masiello teaches Latin American and comparative literature at the University of California at Berkeley. 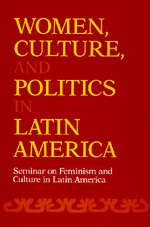 Francesca Miller teaches inter-American relations and women's history at the University of California at Davis. Marta Morello-Frosch teaches Latin American literature at the University of California at Santa Cruz. Kathleen Newman teaches Latin American film and mass communications theory at the University of Iowa. Mary Louise Pratt teaches comparative literature and literary theory at Stanford University.